An example of what we can do for you. 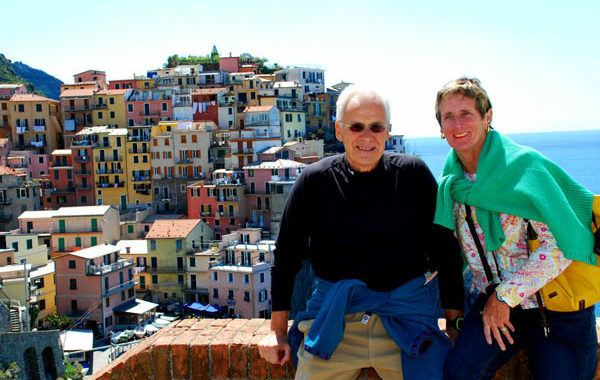 As all of the tours that European Focus leads are custom-designed, this trip plan is for those who want to just “Go to Italy!” and who want to go now, without a lot of time planning. To book this tour, please go to our sign-up page and select Italy Highlights. The wonders of Italy at a relaxed pace. This tour can be customized to add or subtract locations. (Venice, for example) However, the tour is priced below based on this itinerary. The tour is priced for two people. We can expand the tour to more people depending on how far in advance you book, price will change. MORNING OF ARRIVAL- You’re met by your tour guide, James Derheim at the airport. We drive into the Eternal City for a three-night stay at a lovely hotel in a quiet neighborhood on the Aventine Hill, one of the seven hills of ancient Rome. This was once a district of villas for the rich and powerful. Now it’s an upper middle class neighborhood with a scattering of boutique hotels. Please note that other than Rome’s oldest church and a nice park, there are no sights to be seen within easy walking distance of our chosen hotel. We stay here precisely because it is not in the hubbub of the city. After a day of being in the hustle of the city, we and our guests find it very nice to come back to this oasis. If you prefer to be right in the thick of things, please let me know so that we can make an adjustment. A light lunch will be served on our arrival (if you feel like it) and then rest for the afternoon. This evening your guide (either James or Jenean Derheim) takes you to their favorite local family-owned and operated restaurant just down the hill from the hotel. On the other two nights you can dine alone at restaurants that James or the hotel recommends. There are a few typical and good ones not far from the hotel with English-speaking staff. We drive to the north, out of the hectic and big city and into the rolling hills of Tuscany for a two-night stay at an island of tranquility surrounded by beauty. We stay at a villa surrounded by lovely gardens and with an onsite restaurant where you dine both nights.You have a large room at this old house which was converted to a hotel. The grounds are lovely with a tiny chapel and infinity pool with view over the Tuscan landscape. It is very peaceful here. During our time here we explore hill towns especially Pienza, which is one of the only “flat” hill towns in Tuscany. We also take a drive through the splendid Val D’Orcia and visit Montalcino, famous for Brunello di Montalcino wines. Dinner starts at 8 each night at the villa’s own restaurant, which only serves guests. You have your choice between three main course items. Your guide does not join you for dinners here. Staying in Tuscany we drive through beautiful landscape to the hilltop town of San Gimignano, referred to as the “Manhattan of Italy.” Why? You will understand as we make our approach. The little walled medieval part will be our home for two nights, in a small boutique hotel with modern conveniences. We are within just a minute or two walk from two of the best restaurants in the area. We see the sights in the town and area with a side trip to another town nearby. We travel to the north a bit with a stop to admire the Leaning Tower of Pisa on our way to the walled town of Lucca. Lucca is full of great restaurants, being a sort of miniature culinary capital of Italy. Enjoy one of the prettiest stretches of coastline in Italy with a day spent on the wonderful Cinque Terre. We take the train there from a nearby small city. Return to Lucca for the night. We make a stop at the American Military Cemetery near Florence. (Florence can be added to this itinerary as a day trip from Lucca) We will stop for two nights at a farmhouse inn located in the countryside outside of the hill town of Orvieto, Umbria. This town is even older than Rome because it was settled by the Etruscans, the civilization that Rome conquered. We stay at a family-owned and operated rustic farmhouse inn (but with all mod-cons including air con and wifi) with large rooms. The best part is the communal dinner enjoyed family-style with the other guests and with the host popping in and out. The dinner is served in three courses and you can take as little or much as you like. Dessert, wine, after-dinner drinks all included. A relaxing lunch in Orvieto and then the roughly one and a half hour journey to a bed and breakfast very near the Rome Airport but in a lovely little seaside community. When James stayed here with departing guests about a year ago we were enchanted and really loved it. The owner arranged dinner for us at what turned out to be one of our favorite restaurants of the entire trip. Note: Where we stay on the final night is determined by how early your departure leaves. Please coordinate with James before booking. If you can get a later departure then we can stay a bit farther outside of Rome. Dinner part of the room package at the two nights stay outside of Orvieto. Many of our guests do not wish to feel compelled to eat three full meals per day while traveling and James certainly cannot due to health reasons. When dinner is included it also includes wine. We offer enough wine to be satisfied but not so much that you ruin your next day with a hangover. One glass of wine or a beer with lunch is also included if you wish. Double occupancy room for the two of you always with private bath and toilet in high quality inns and hotels. Transportation by our company-owned full-sized van or another vehicle also comfortable and roomy. Note: With generous breakfasts in the places where we stay and with a later lunch you will probably be well satisfied and will not want to have a big dinner, or at most, a light snack. This avoids the dreaded ‘stumbling from one big meal to another’ aspect of some trips. To book this trip, please visit this page where you may select “Italy Highlights Tour” or call 941-706-4508 and ask how this trip can be molded to fit your needs. Posted in Italy Tours, Planned Tours and tagged custom, designed, highlights, italy, private, tour, trips.